Available "Baby" bed In each room a wardrobe as well as a small office area ..... The bed linen and included in the service if you wish. A shower room functional and coquettish. Towels and towels are provided and included in the service. 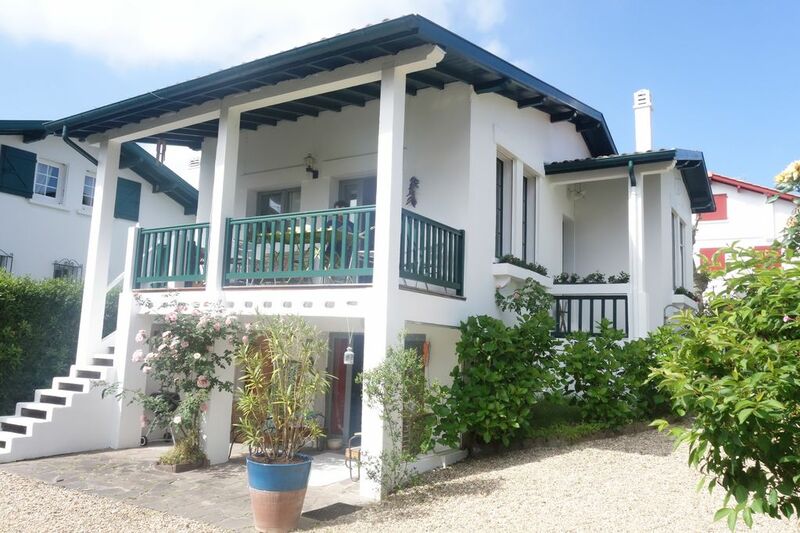 Near to Biarritz: 10 Km Sea: 0 Km Shops: 0 Km Town center: 0 Km Ideally located between Biarritz and Saint Jean de Luz, in the charming village of Guethary, the villa is located 5 minutes walk from the beach of Cenitz and Parlemencia and 2 minutes walk from the center of the village. We have loved our stay at Bruno's beautiful house in Guethary, we especially enjoyed the balcony and garden which allowed meals outside in any kind of weather. Bruno made sure we felt at home in his house and was available for any kind of questions. The check in and check out was super uncomplicated too, which we want to thank Bruno for once again. Maison cosy très bien située par rapport au centre et à la plage. Propriétaire plus qu'acceuillant et très arrangeant. Séjour agréable, très bon accueil des propriétaires . Maison confortable pour un couple avec 1 enfant. Gros plus: terrasse et localisation à 2 mn des plages et du centre du village. Bémol sur le ménage et le voisinage bruyant. Merci à M. Angillis et sa sœur (sur place) pour leur accueil et leur confiance. La location se situe dans la partie supérieure de villa. Petite, mais bien agencée et décorée (et propre), on s'y sent bien. Accès à la plage et à tout Guéthary à pied. Environnement calme. J'adore cette maison et ses propriétaires. L'accueil est tjrs parfait et je reviens depuis des années..
Maison de village très agréable, belle déco et assez proche de centre d'intérêt. Le village de Guethary est très animé et très joli. Belles vacances dans la région. Guéthary is a delightful little village of the Basque country located 5 km from Saint-Jean de Luz, Aquitaine, Atlantic Pyrenees, near Biarritz, 20 km from Bayonne and Spain. A64 - Exit St Jean de Luz North minutes from Biarritz International Airport and close to train station. Cinderella villa is located in the village of Guethary, beach walking .... Cinderella, it is the atmosphere of a small house "family" where you will feel welcomed, expected, where you relax. Tennis, Gulf pools nearby, the countryside, the mountains and the sea simultaneously, spa, winter sky .... Equitaion program, surfing and other sports activities in the program. Shuttle bus summer. The casino remains a solutin for non-athletes. Golf: It all began in 1924, the company "Biarritz Anglet Forest" became the owner of 150 hectares of forest and dunes to install a golf course. In 1927, the famous architect Tom Simpson raises his pencils facing the Atlantic for the pleasure of the Duke of Windsor, the origin of this fun project. In the architect's contract, it is stipulated that Simpson had to create the finest golf course in the world! In 1928, the first professional France Championships in 1938, CHIBERTA becomes a Mecca of sport and the refined elegance of the Basque Coast. The Club House Chiberta is the scene of events that bring together all the Gotha of the time. a lake in a quiet poetry, softly undulating greens and an abundance of pine with silver oak barrels darkest green argued jades and emerald lawns. In 1940 CHIBERTA will be totally overwhelmed by the occupation, and in 1951 Mr. Van DAELE takes the field and began to renovate it.